If you didn’t know already, Google has been working on a platform for mobile phones named Android. Android is an open source platform that is based on the Linux platform. The G1 will be in competition with the Apple iPhone and will feature an App store that is very similar to the one that is currently in place for the iPhone. Many of the features will even be similar while the interface will be much different. The current price for the HTC G1 is set at a very competitive price – $179, just $20 less than the iPhone. 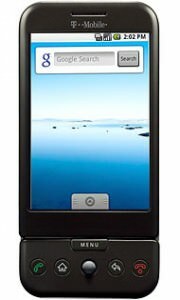 The G1 looks fairly similar in appearance to the iPhone, featuring a large touch screen. 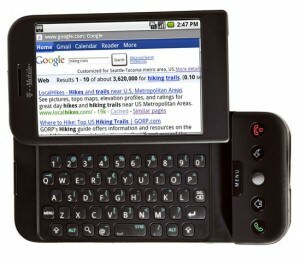 However, the G1 also features a slide out keyboard and in a very slick way. The screen of the phone slides to the right and underneath where the screen was is now a full featured keyboard! We’ll see. For now I’ll just be keeping up with some of the latest news on it. I now have an Amazon Wishlist setup. 😛 So feel free to make a purchase whenever you see fit. 😉 The link is also in the list on the right.